An interview with the director of the Department of physical culture and sports of Ugra Sergey Artamonov was held in the press-center of Women’s World Championship. 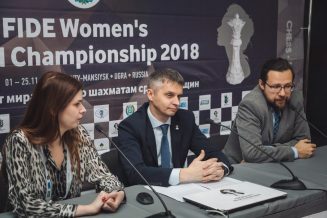 – Sergey Ivanovich, we are now at the Women’s World Championship, tell us how important it is for this region to host this kind of tournament? – It is out of doubt that organizing high-level chess tournaments for us is not important only by itself. This is only one of the means of bringing the inhabitants of our region into this game. Chess is now an important part of life for Ugra people and it has really become a mass sport. The statistics backs this. Nowadays there are many people studying chess in special groups and all school children of the region are doing chess in schools. 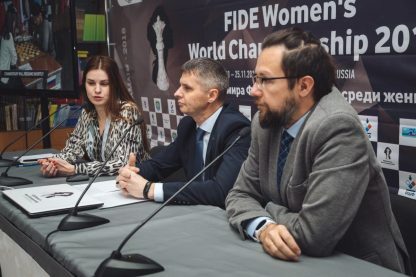 I’ll tell you a fact highlighting the degree of the development of chess in the region: Russian national teams that were recently playing at the Chess Olympiad in Batumi – both men’s and women’s – had players from Ugra – Dmitry Jakovenko and Olga Girya. A very strong team of organizers which is able to carry out events of any kind of significance in shortest terms was formed. We are trying to be up to time with carrying out chess tournaments as well. – You have mentioned Chess Olympiad in Batumi and as we all know Khanty-Mansiysk will host another Chess Olympiad in 2020. Please let us know how the city and the region are getting ready for this event? 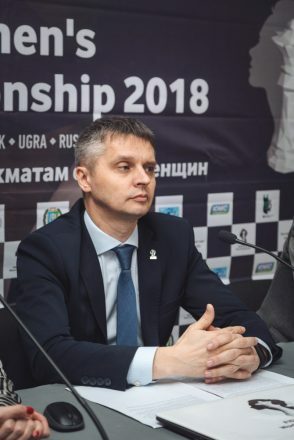 – Yes, the 44th Chess Olympiad will take place in Khanty-Mansiysk in August 2020. Basing on the previous experience, we can say that representatives of more than 180 countries will arrive here. The key year in preparation for the Chess Olympiad will be 2019 and also we will host the World Cup that year. However, we are already working on infrastructure projects that will both help us to organize the Chess Olympiad and later will be used by Ugra people to do sports. – Are we talking about the playing venue or hotels as well? – It is actually both. 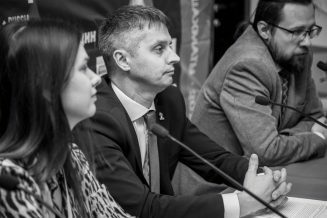 – Khanty-Mansiysk had already organized nearly every kind of chess events with the only exception of World Championship title match. Are you planning in the foreseen future to bid for this event too? – That’s true, in the last 20 years Khanty-Mansiysk has organized almost all kinds of chess events and having a Chess Olympiad for us is really a big deal. I am quite confident that Khanty-Mansiysk deserves to host the highest level chess competitions and if we set this goal and get this opportunity we will organize this for the highest possible level. – In one of your interviews you said that chess and biathlon are two key sports in Ugra. Why is that? – Let us start that this two sports are the most popular ones in Ugra. Both by a number of people doing these sports and by a number of competitions organized on the territory of the autonomous region. More than that, biathlon competitions are usually visited by big number of spectators, while chess is a sport that is watched by viewers all over the world by means of Internet broadcasting. 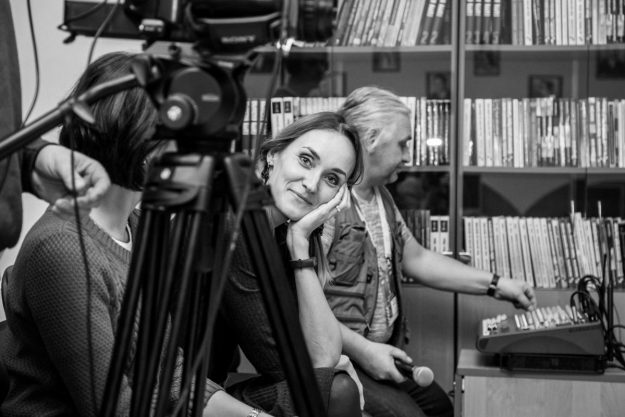 Biathlon World Cup legs in Khanty-Mansiysk were attended by several thousands of spectators and, talking about Women’s World Championship, by this day more than 500 000 views from all over the world have watched our broadcasts. In eyes of people from other countries Ugra is strongly associated with both biathlon and chess. We have ideal conditions for these sports. – It is difficult to argue with that. Thank you!